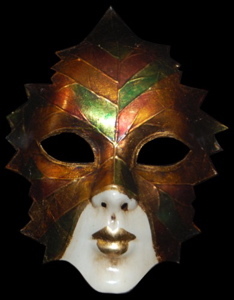 Leaf shaped mask with many different shades of gold, bronze, green. 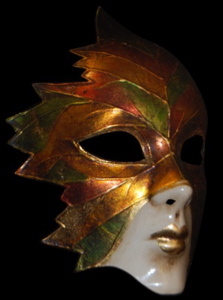 You’ll be hard pressed to find a more exquisite mask for your next masquerade ball or costume event. Our Volto Foglia fancy fantasy full face leaf mask features hues of gleaming gold, brilliant green, opaque red and brushed bronze over the surface of the mask. The jagged edges of our Foglia masquerade masks, as well as the painstakingly drawn on leaf veins give this mask a realistic look. As one of our most beautiful masquerade masks, the white nose and chin provide a nice contrast, while the gold lips match colors from the leaf. 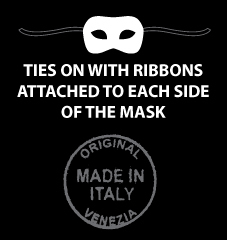 Complete with satin ties, our Foglia Venetian masks will leave a lasting impression for those in attendance at the Mardi Gras celebration or masquerade event.